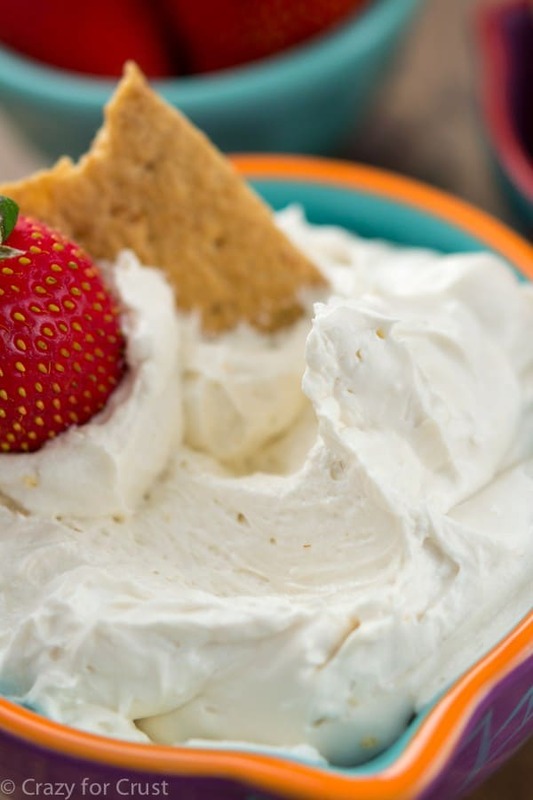 Perfect for a party or easy dessert, this Skinny Candy Dip has only 3 ingredients! Added bonus: you can use up all that Halloween candy to make it. Would you consider yourself a stylish person? I am the worst at being stylish. It’s a chore for me, really. Also, I have no clue what I’m doing. Put it this way: if you see me and I’m wearing a necklace, consider yourself lucky. I got dressed up for you! I find that my difficulty accessorizing my outfit bleeds over into other areas of my life. I’m also not good at decorating my house (a throw pillow counts as decoration, right?) and I’m really not good at accessorizing my food photos. Have you ever noticed how I have the same dishes in all my photos? Or the same napkins? Or how I get rightupclosetothefood so you don’t see much around it? I just don’t know how to accessorize. I don’t even know how to think about adding props into my photos. It just doesn’t even really occur to me…until I look at the pictures after. This reason, my inability to prop, is one of the reasons I’m loving my new countertops. I feel like they’re so pretty I don’t even need to do anything besides drop the food and shoot! If you read my kitchen reveal post, you will have seen my new counters. They’re white and look like marble, and they’re beautiful. Also? They’re not marble. They’re durable quartz! I can go from prepping my recipes to shooting my recipes and I don’t even have to do any setting up of any special boards or surfaces. Pretty much, to me, that’s perfection. Because I probably wouldn’t to do it anyway! When we were trying to find the perfect countertops for our new kitchen, I knew I wanted quartz because it’s durable, a solid surface, and it’s gorgeous. When my designer showed me the DuPont Zodiaq quartz surfaces, I fell in love. I didn’t even have to see a sample of the Coarse Carrara to know it was what I was going to choose. Zodiaq quartz is a engineered with pure quartz crystals. It’s long-lasting, GREENGUARD Certified®, and it’s heat and scratch resistant. And did I mention how pretty it is? We love our counters – I think it’s one of my favorite parts of the whole kitchen. 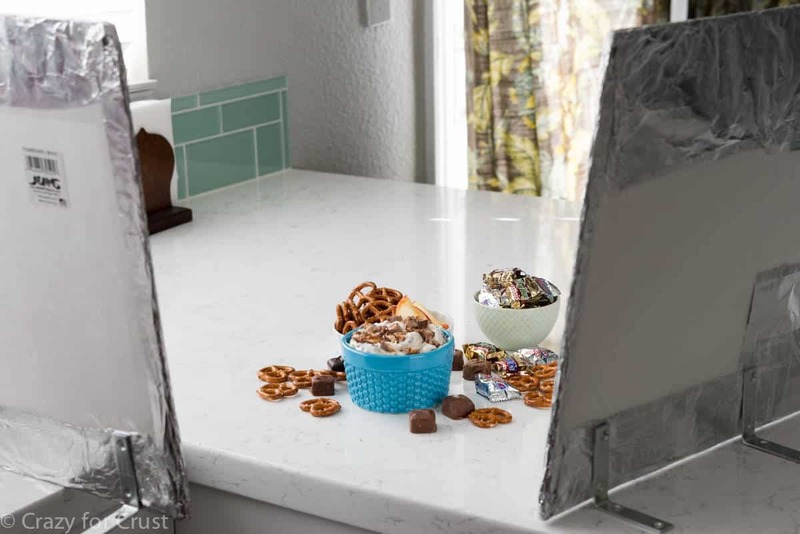 If you’re thinking of doing a remodel, check out the DuPont Zodiaq quartz surfaces – you’ll love them! Also? You’ll love this dip. 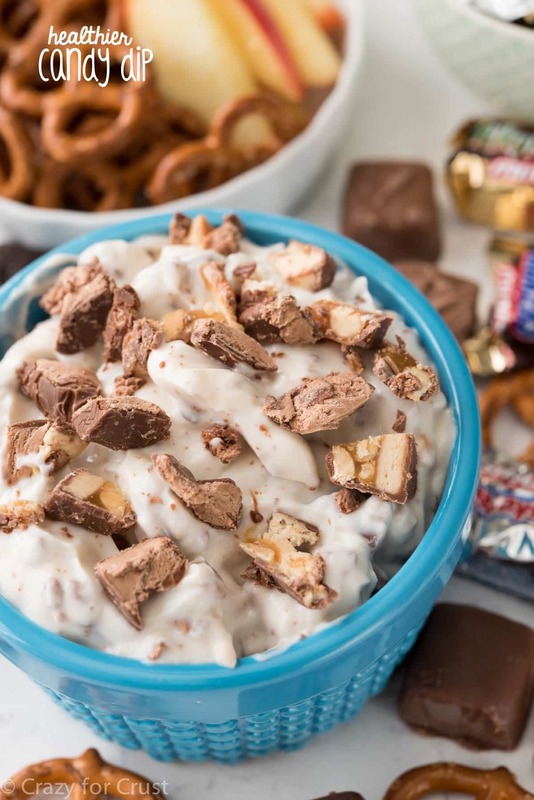 It’s a Skinny Candy Dip, filled with chopped leftover Halloween candy. And it only has 3 ingredients! Sometimes, when Jordan has friends over, I want to make a treat that will keep my reputation of the “Mom that gives us dessert!” going but I also want to serve something that the parents won’t hate me for (too much). Dips are the perfect thing to serve for this reason – they’re fast, easy, and they feed a crowd. Bonus points if you can dip apple slices in it! While many of the sweet dips I make aren’t healthy (like brownie batter, peanut butter, and Snickers), this one is a little bit healthier. And it only has 3 ingredients, one of which you can totally omit…if you want. Ready for it? Greek yogurt, caramel sauce, and candy. Stir. Eat. This recipe is the perfect one to use up extra Halloween candy. Make it for Thanksgiving or Christmas or New Year’s. Make it for a football party or an after school play date. Heck, make it for a random Tuesday snack! We dipped pretzels and apple slices. And by that, I mean I ate it with a spoon. I used nonfat vanilla greek yogurt. You can use regular vanilla yogurt (that’s not greek) if you prefer. You can also use plain yogurt, but then you might want to add more caramel topping for sweetness. Speaking of caramel topping, you can totally leave it out if you don’t want it there, but I love adding it for a touch of extra flavor. You can use any caramel sauce you have – homemade or ice cream topping, even sugar-free. Use any chopped candy you have! Raid the Halloween stash! I used Milky Way, 3 Musketeers, and Snickers because it was what I had. This would also be good with peanut butter cups or Kit Kats. 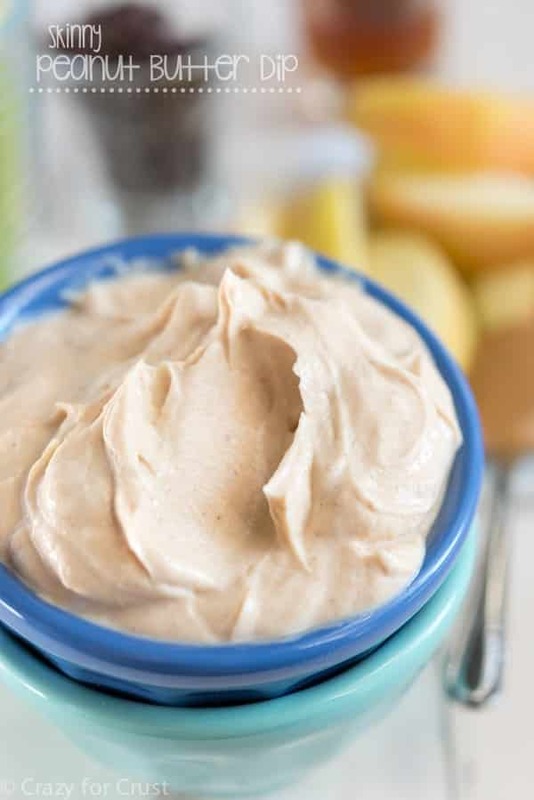 Any way you make this, it’s the perfect easy sweet dip for any day! Enjoy! This Skinny Candy Dip has only 3 ingredients! 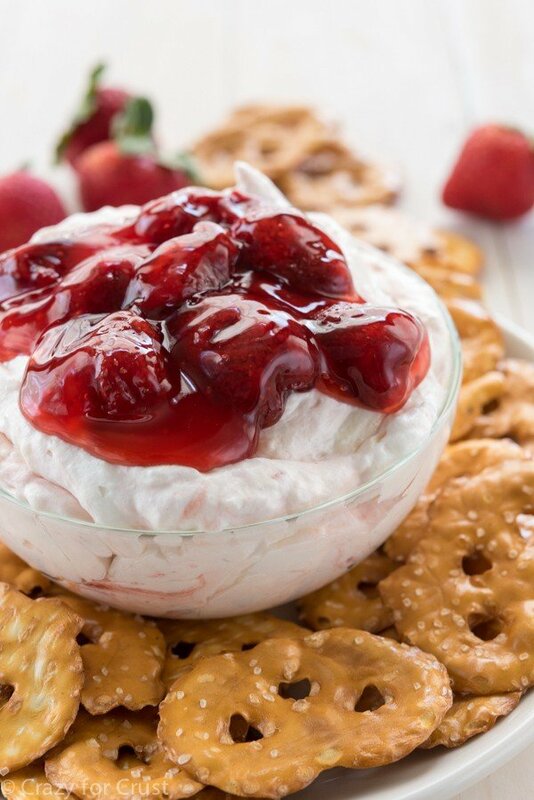 Made with greek yogurt, it's just a bit healthier and the perfect party snack! Stir together yogurt and caramel sauce. Stir in candy. Serve with pretzels, small cookies, crackers, or apple slices. 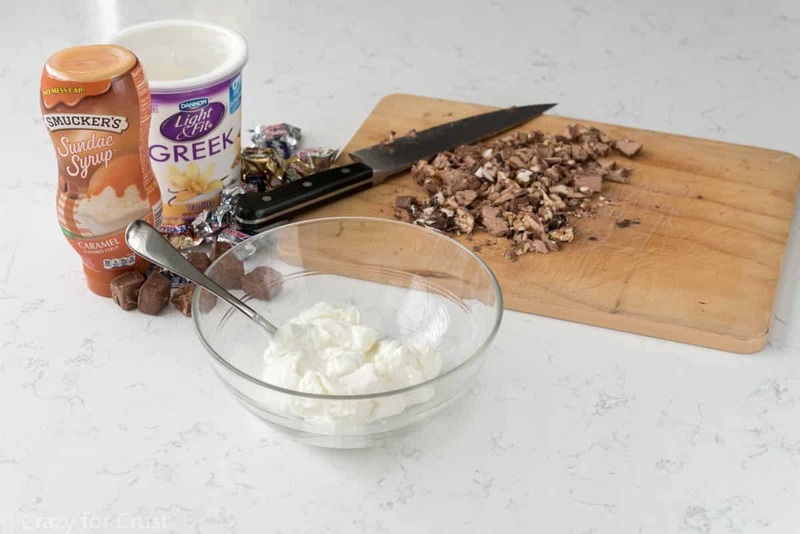 If you want to use plain greek yogurt, you can, but you will need to add more caramel sauce to taste. If you don't like greek yogurt, you can use regular vanilla. I recommend low or fat-free! Use any chopped candy you like: Snickers, Milky Way, Kit Kat, Reese's, etc. Just clean out your Halloween candy! As part of my working relationship with KitchenMart and DuPont, I was provided countertops at no charge in exchange for a review post. All opinions are 100% my own. I could eat this dip with a spoon. So glad it’s skinny. A skinny dip filled with candy?! This is perfect, Dorothy! Your uncluttered close-up food photos put the emphasis on the food (always a good thing, I think, for a food blog 😉 ) I bet Jordan and her friends love after-school snack at your house! 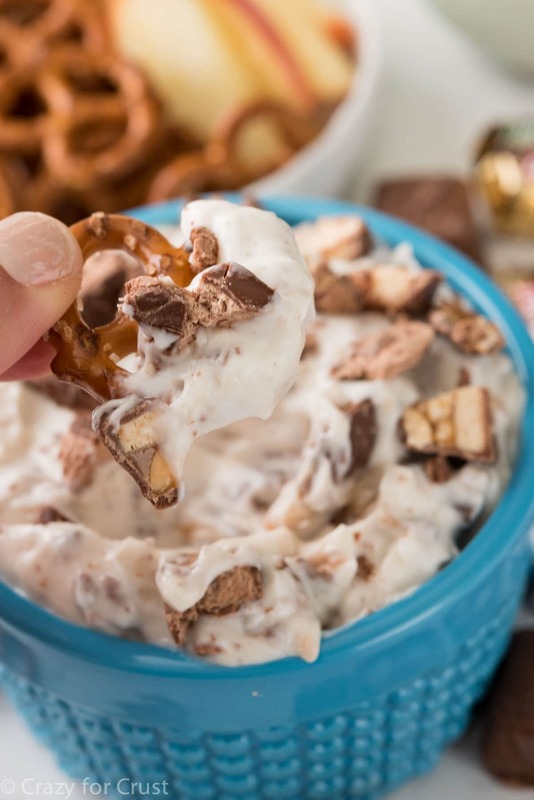 Dessert dips are fun and this one would be quick and easy to prepare. Bring on the left over Halloween candy! It’s a good thing that’s a good thing. I’d be lost otherwise!! Thanks Wendy! I wouldn’t call my self stylish, but I do adore shopping and putting together outfits!!!! Although most days I’m still in my workout clothes until the afternoon…LOL! I love easy dips like these that use yogurt. And hello, candy toppings are the best!!! And that counter top…I need that in our new house for sure!! Love it!! 2-ummm I think I’m bad at accessorizing things too! I usually just like to wear big earrings, nothing more than that. I have the hardest time with the photography props and I have a hard time decorating the house, too! 3-YUM YUM YUMMY YUM! love this dip! I love this skinnified dessert! Thanks for sharing!